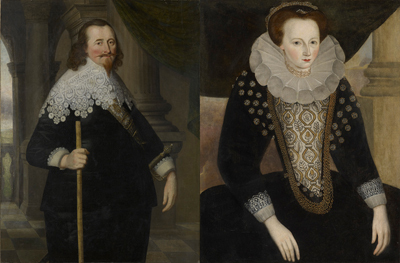 These significant regional portraits show two generations of Trelawnys; Sir John, the first Baronet, and Elizabeth, his mother. The Trelawnys were an illustrious, long-established Cornish family, who had sat in Parliament since the 14th century. They first came to national prominence during the reign of Henry V, when Sir John Trelawny fought at Agincourt. As a mark of the family’s debt to Henry V, a portrait of the King was displayed at their property at Lanceston in Cornwall, with the moto ‘He that will do aught for mee, Let hym love well Sir John Trilawnee’. They were particularly prominent during the Civil War, a role underpinned by Sir John’s daughter’s marriage to Sir Frances Basset of St Michael’s Mount, thus uniting two prominent West Country Royalist dynasties. In 1628 Trelawny took a leading role (along with Lord Mohun) in trying to block the election of two MPs from Cornwall, Sir John Eliot and William Coryton, who were leading the growing Parliamentary revolt against Charles I. He was unsuccessful, however, and after Eliot and Coryton were returned to Westminster, Trelawny was summoned to Parliament to explain why he, as a magistrate, had used his position to interfere in the election. When he refused to attend the Commons he was arrested and sent to the Tower of London for contempt. He was released only after the Commons was prorogued, when the King ordered the governor of the Tower to free him. In recompense for his imprisonment, and as a reward for his support, Charles I made Trelawny a Baronet (which survives to this day). Later, in 1630, Trelawny was appointed High Sherriff of Cornwall. The present portrait, which can be dated by the style and fashion to about this time, may well have been commissioned to celebrate Trelawny’s new position. He is also seen holding what could be a “penwork” decorated cane, a form of English folk decoration that may well allude to its Cornish provenance, adding a strikingly decorative departure from the conventions of contemporary portraiture. Interestingly, the architectural background setting is identical to the c.1600 portrait of Trelawny’s father, Sir Jonathan Trelawny (1568-1604) [Royal Institution of Cornwall], who was knighted in 1598 by James I. It is possible that the setting relates to the family’s new home at Trelawne, which was acquired in 1600. Trelawny continued his support for the King throughout the ensuing Civil War. He was a Royalist commissioner during the conflict, which saw his total estates valued at £1,000, while his son (also Jonathan), despite being only a teenager, raised a company of foot for Charles I and ended the war in command of a regiment of cavalry. Sir Jonathan’s daughter Anne married Francis Bassett in 1620, thus bolstering both families’ regional Royalist statuses. A sheriff and vice-admiral of Cornwall, like Trelawny, Basset was militarily highly active in Cornwall, raising money and drilling forces for the king. Letters between Sir Jonathan’s daughter and Francis Basset are preserved, recording the Royalist victories of Stamford Hill near Stratton, and of Braddock Down near Lostwithie. Shortly after the second of these battles Francis was knighted on the field. He records in a letter to his wife that after the battle ‘the king, in the hearing of thousands, as soon as he saw me in the morning, cryed to mee “Deare Mr. Sheriffe, I leave Cornwall to you safe and sound”’. The baronetcy title passed to their second son John, and then by direct family descent to Francis Basset, 1st Baron de Dunstanville of Cornwall and Evenley in Northamptonshire, after which it became extinct on his death in 1835. Sir Jonathan’s mother, Elizabeth, Lady Trelawny, is the sitter in the slightly earlier portrait of the 1580s or 1590s and embodies a highly significant aristocratic bloodline introduced to both the Trelawny, and thus subsequently the Basset families. Elizabeth was the daughter of Sir Henry Killigrew (c.1528-1603), one of Elizabeth I’s leading diplomats, and Catherine (d.1583), daughter of Sir Anthony Cooke. Sir Henry Killigrew’s numerous diplomatic missions for Elizabeth I (he was sent to liaise with Mary Queen of Scots more than once) and his close personal connections to the Elizabethan Court (William Cecil, Elizabeth I’s most important courtier, was his brother-in-law) infers that he named his daughter after the Queen. Ironically, Elizabeth Trelawny’s portrait was mistakenly identified as Elizabeth I when it was exhibited at the National Portrait Gallery Exhibition in London in 1866 (when it was lent by her descendant Sir John Salusbury-Trelawny, 9th Bart.) The two pictures remained in the Trelawny family until the mid-20th Century, when they were separated as part of a dispersal of 14 family portraits.